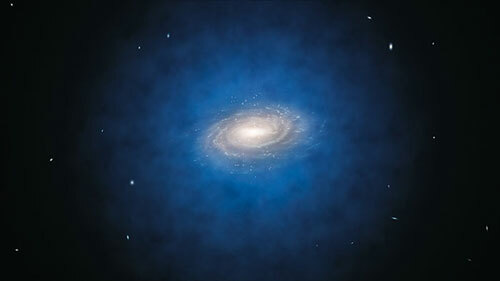 (Nanowerk News) A new measurement of dark matter in the Milky Way has revealed there is half as much of the mysterious substance as previously thought ("On the Shoulders of Giants: Properties of the Stellar Halo and the Milky Way Mass Distribution"). Australian astronomers used a method developed almost 100 years ago to discover that the weight of dark matter in our own galaxy is 800 000 000 000 (or 8 x 1011) times the mass of the Sun. They probed the edge of the Milky Way, looking closely, for the first time, at the fringes of the galaxy about 5 million billion kilometres from Earth. Astrophysicist Dr Prajwal Kafle, from The University of Western Australia node of the International Centre for Radio Astronomy Research, said we have known for a while that most of the Universe is hidden. “Stars, dust, you and me, all the things that we see, only make up about 4 per cent of the entire Universe,” he said. Dr Kafle, who is originally from Nepal, was able to measure the mass of the dark matter in the Milky Way by studying the speed of stars throughout the galaxy, including the edges, which had never been studied to this detail before. Dr Kafle’s measurement helps to solve a mystery that has been haunting theorists for almost two decades. “The current idea of galaxy formation and evolution, called the Lambda Cold Dark Matter theory, predicts that there should be a handful of big satellite galaxies around the Milky Way that are visible with the naked eye, but we don’t see that,” Dr Kafle said. “Dr Kafle’s work has shown that it might not be as bad as everyone thought, although there are still problems to overcome," he said. “Be prepared to hit 550 kilometres per second if you want to escape the gravitational clutches of our galaxy,” Dr Kafle said.